DIY dorms: Students from mountainous and isolated areas have to set up huts near the school so that they can get to class on time. Most students who reside far away have to stay around the school because it has no dormitories, said a student at Truong Ngoc Khang School in Quang Ngai's Tay Tra District. "Only few houses are around the school, so there are no rooms available on rent for students. 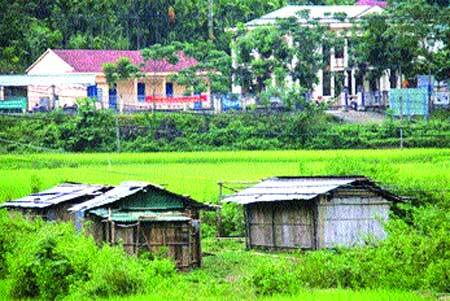 Hence, most of us have to find materials to set up makeshift huts to stay," said student Dinh Van Linh. 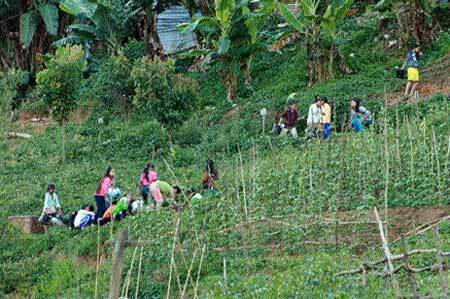 Over the past years, the mountainous district has been the poorest area in the province. The ratio of school-going children is very low. Tay Tra's education sector is using all its possible resources in an attempt to overcome these difficulties. The district now has more than 5,000 students of different levels. This number was maintained during the last school year. The Tra Phong Commune has two schools: the Tay Tra Senior High School and the Truong Ngoc Khang Junior High School, so it is considered the "capital of knowledge" of the district. The poor economic conditions, remote mountainous terrain, which makes travelling difficult during the rainy season, coupled with erratic weather, have forced many students of the two schools to set up shacks that function as temporary accommodations on the mountainous side or in the moors. These shacks, each being only about 10sq.m, serve as an accommodation for four to five students. They eat together, share a blanket, and study under the light of an oil lamp. Currently, there are about 20 huts set up by the students around the schools. As these students lack food, clothing and accommodation, they therefore face many hardships. Most of the students are from poor and ethnic minority families, so they have to go to the forest every day to look for cassava and potato to improve their meals. Moreover, they also have to grow vegetables beside their huts. When we visited this hamlet, these little students were cleaning the vegetables, in preparation for lunch. As the students, particularly young girls, were quite surprised and embarassed to see visitors, many of them rushed into their rooms and closed their doors. We then learned that their rooms were too cramped and their tables were too small. Thus, they had to place their books on the floor and on the bed. They have to stand further hardship during the hot summer days and when it rains, they suffer even more as the water leaks down profusely, which forced them to evacuate their homes on several occasions since their clothing and books got totally soaked. Moreover, the temporary rooms made of board, bamboo and leaves failed to withstand the wrath of nature, such as tropical storms and heavy rains, causing damage to their personal belongings. So, these poor students are always bogged down by worries as the storm season approaches. Having visited Tay Tra District in the rainy season, we recognised the hardships faced by the local people. Incessant rains led to landslides in many routes, causing traffic jams, while many localities were blocked by flooding. So, the students living in such schools faced serious problems as their families can hardly provide rice and other food items. Rector Nguyen Cong Hoa said that the teachers have to help the students for every meal during the stormy days. "But, due to the large number of students and the teachers residing far from the school, hence, they cannot be of much help. Some children only get to have one meal a day, which is not enough to ensure health for sound learning," he added. Recently, the Tay Tra High School considered offering scholarships to the poor students. The teachers received dozens of applications for scholarships and all of them were from students in need. However, the school's scholarship funds are limited, only about VND30 million (US$1,500) each year, contributed by the teachers and some local donors. Teacher meetings have also been tense as petitions are read with the hopes of receiving continued assistance for the school. "We felt bitter, but we had to select only five students who are especially poor and will receive help first," said Hoa. He showed us five scholarship applications that have been selected. While reading these petitions we felt immense sympathy for the students. Girl student Ho Thi Hai wrote: "My family is very poor and we are 10 brothers and sisters in all. All of us have the desire to go to school. But, my parents are in poor health and can hardly do farming jobs. So, we lack food and clothing throughout the year. I beg the teachers to help us come out of this situation." After the meeting, the teachers voluntarily donated part of their salaries to help them. Some teachers offered VND1 million from their monthly salary of VND3 million. Most of the teachers are people from lowland areas. They stay in the school and only visit their homes on weekends. Therefore, the teachers always consider "School is home" and "students are our juniors". After dinner, the teachers visited each boarding room to tutor their students and remind them to maintain sanitary accommodation conditions. With nearly 300 students living in the dormitories, concerns about their health and meals is a major responsibility on the shoulders of 38 teachers. "It is a matter of endless joy for us whenever a day passes wherein we see all students coming to class and nobody has any sickness," said rector Hoa. He added that their two dormitories only provided housing for 176 students, and other 100 students had to set up makeshift houses on the hills around the school. "We have repeatedly urged the authorities to solve this problem, but we are still waiting for their assistance. We teachers know that the students make significant efforts to go to school, so we also try to create conducive conditions for them so that they have peace of mind while learning," he said. We left the hamlet of poor pupils when drum beats signalled the start of a new session.